At least 12 million Britons now suffer from allergies caused by dust mites, a report by the charity Allergy UK has revealed an epidemic of “home fever”, a range of symptoms caused by dust mites and other triggers around the home. Irritation of the eyes, attacks of sneezing and coughing and shortness of breath in the early morning hours are typical symptoms of this type of allergy. These reactions are triggered by the proteins in the excrement of the dust mite. Mites are virtually ever-present in a moist, warm micro-climate, as often predominates in beds. They primarily feed on human skin scales and moulds that can be found in every household. Even with regular, thorough cleaning, dust and skin particles constantly accumulate. So what’s unique about the Monogram AllergyFree Heated Bedding range? The AllergyFree Heated Blanket is purposely designed to reduce and protect against house dust mites, odour-causing bacteria and mould growth by using heat and advanced HHL Health Protection fabric technology. The combination of the HHL fabric treatment and regular doses of maximum heat to the mattress will create a very inhospitable environment for house dust mites; making this product ideal for allergy and asthma sufferers! Monogram by Beurer continues to lead the field across Europe by introducing the next generation of Heated Bedding products. The AllergyFree range combines traditional comfort and warmth with cutting edge technology and health benefits. The fully fitted design and super breathable cotton materials provide all year round added comfort for you and provides added protection to your mattress also. Detachable controllers have 6 temperature settings including a pre-heat facility. Operates from less than 2p per night (based on an 8 hour night); with auto switch-off after 1, 3, 6 or 12 hours. Individually adjustable timer ( 1 hour intervals ) and fast heat-up time enabling you to feel the warmth in approximately 8 minutes. The AllergyFree range is crafted in Beurer’s high tech European factory using soft materials, ultra-thin wires and fully fitted with a deep elasticated skirt. The easy fit design with a generously deep elasticated skirt fits over your entire mattress, just like a fitted sheet! 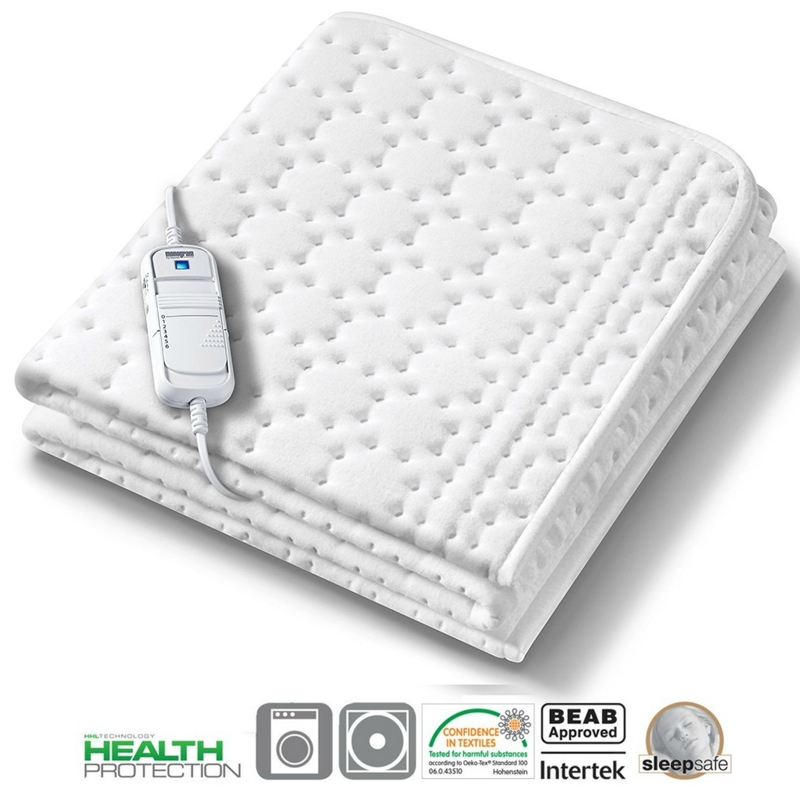 Suitable for all night use and fully equipped with the Beurer Sleep-Safe Safety System with overheat protection; it is also Oeko-Tex Standard 100 certified which means that the textile materials used to make this blanket meet the stringent human ecological requirements as verified by the Hohenstein Research Institute – extra quality and safety assurance for you and your family! Beurer of Ulm, Germany was founded in 1919 and is synonymous with health and well-being. The company developed the first heating pads in Germany whilst today's range encompasses a wealth of products for health and well-being, beauty, baby care, sports, medical, diagnostic and prevention sectors. Products include heating pads, heated bedding, blood pressure and blood glucose monitors, nebulizers, clinical thermometers, personal and kitchen scales, foot spas, air humidifiers, Shiatsu massagers, baby monitors, heart rate monitors and cosmetic mirrors. Beurer GmbH is a medium sized privately owned group operating a global distribution network in more than 80 countries and currently has a workforce of over 350 people. Beurer is the European one–stop specialist for health and well-being consumer electronics products. Our success is due to our long-standing reputation for well-engineered, quality made products; driven by innovation and safety. Oeko-Tex Standard 100 certified. The textile materials usedto make this blanket meet the stringent human ecological requirementsas verified by the Hohenstein Research Institute – extraquality and safety assurance. Buy with Confidence from a Monogram Authorised Dealer and All Purchases come with a VAT Receipt.